KISSIMMEE, Fla., July 18, 2016 – Honesty in conducting its business affairs and timely answering of phone calls combined with convenient payment options and bills that are easy to understand helped maintain a high level of customer satisfaction at Kissimmee Utility Authority in 2016, according to results of a customer survey released today by the utility. Responses were measured on a scale of 1-10, with 10 being the highest. 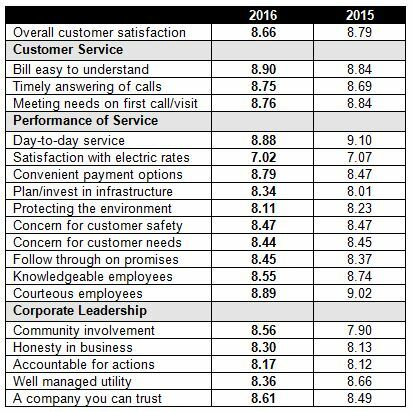 Overall satisfaction with performance of service remained the same in 2016. Satisfaction with electricity rates was 7.02, the second highest score recorded since 2007. KUA has operated 11 consecutive years without a base rate increase. Corporate leadership scores increased by 1.7 percent. Survey respondents expressed trust in KUA as an organization, seeing it as a well-run utility that is accountable for its actions. The survey also revealed an increase in electronic bill and automatic bank drafting participation.